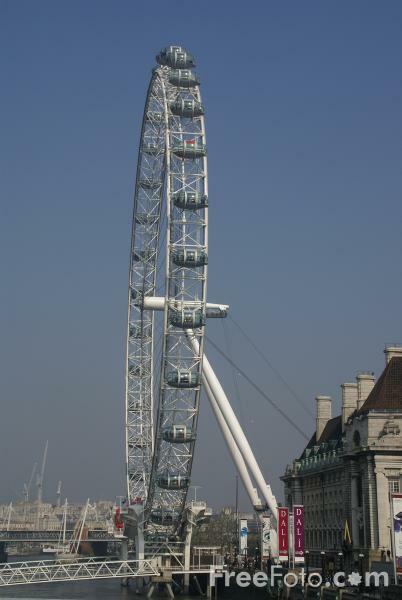 The London Eye is the world's largest observation wheel, situated on the South Bank of the Thames. Reaching a height of 135m (450 ft), the London Eye will become London's fourth tallest structure. The wheel gives passengers a totally new perspective of some of the capital's most famous landmarks and provides a bird's-eye view usually afforded only by helicopter or aircraft. London architects David Marks and Julia Barfield conceived and designed the London Eye to celebrate the Millennium and beyond. VIEW: More images from the category View from the London Eye or taken at the same location or around the same time .